It is no secret that most women love jewellery. I say most because there are some who don’t and that is ok, jewellery isn’t for everyone! A little while back I shared with you on Facebook the lovely necklace I created that I will give to Bella when she is older. It is a necklace in memory of her Great Grandma who passed away this year. Well today I am back to share with you another amazing piece from their collection that is currently FREE with purchase! I absolutely love Persona for quality jewellery at an affordable price. Whether you are shopping for your girlfriend, wife, mother, daughter, or sister, Persona has something for every jewellery lover! So, if you are a last-minute shopper Persona has you covered with great prices and an amazing selection. The Persona Sterling Silver Bolo Bracelet is a one size fits all bracelet with its unique sliding adjustor. This bracelet features a sleek opening mechanism on one of its joints to add charms, and includes two silicone stoppers to hold your charms in place. Persona’s exclusive bolo bracelets are made in Italy so you know they are of the highest quality. Aside from their great prices, another thing I love is that Persona bracelets are compatible with Pandora charms. This means I can use both my Persona and Pandora charms on my Persona bracelets! I own the Persona Bolo Bracelet in rose gold and can’t wait to add the silver to my collection. One of my favourite features is that it’s adjustable. I have a somewhat slender wrist so I like that I can adjust it to be as snug or loose as I want. Bella is even able to wear my bracelet when adjusted to the smallest setting. That means I don’t have to worry about it sliding off her wrist and vanishing while she plays dress up with all my things. The Sterling Silver Bolo Bracelet retails for only $85.00 CAD! If you are curious about the charms featured above they are all sterling silver. 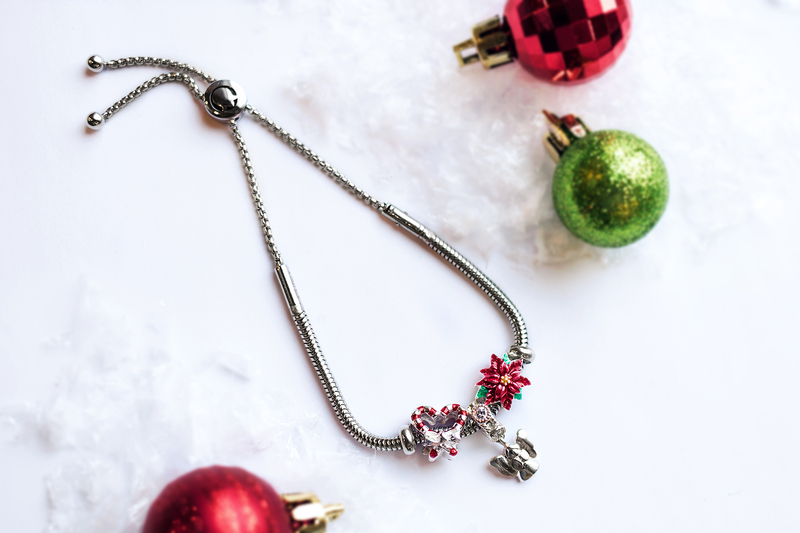 The flower and candy cane charms are part of their new holiday collection, and the divine Angel charm is from their spiritual & faith collection. They have so many gorgeous charms to choose from, I just want them all! Are you excited for an awesome promotion? Starting on December 7, 2017 until December 25, 2017, you can get a FREE sterling silver bolo bracelet ($85 CAD) with any purchase of $125. You can create a gorgeous bracelet for your loved one with this promotion. Don’t forget to check out their sale section for amazing deals on charms too. Some are as low as $9.00 and up to 70% off! Free shipping is offered on all orders of $85 or more for Canadian customers, and $99 or more for US customers. For my Canadian readers you can shop PersonaWorld.ca and for my US readers you can shop PersonaWorld.com. It would be the holidays without some giving right? 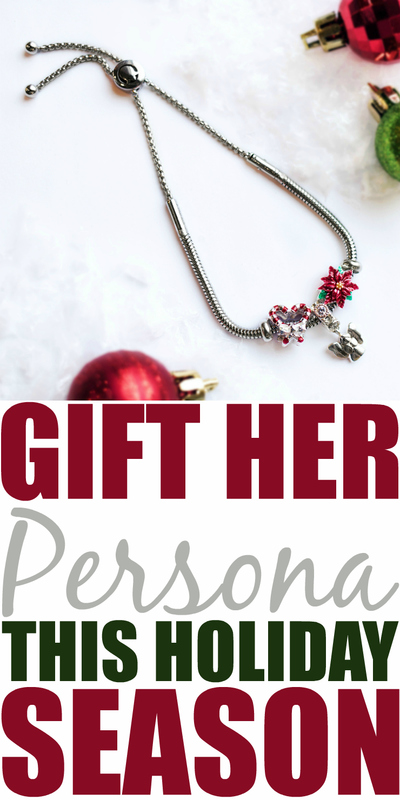 I have teamed up with Persona for an amazing holiday giveaway. One lucky reader will win a $100 gift card to Persona! This giveaway is extra special because they have offered it to both my Canadian and US readers 18+. To enter the giveaway complete the mandatory entry options in the giveaway widget below. Once you have completed your mandatory entries you will be able to complete additional non-mandatory entry options. Complete those for additional ballots in the giveaway! This giveaway will close on December 14, 2017 at 11:59 PM EST. A winner will be drawn from all eligible entries and contacted via email on December 15, 2017. The winner will have 24 hours to respond to the email and claim their prize. If they fail to do so a new winner will be drawn. Disclosure: Although this post is sponsored by Persona, the opinions and language are all my own, and in no way do they reflect Persona. Any product claim, statistic, quote or other representation about a product or service should be verified with the manufacturer, company, provider or party in question. Find more great holiday giveaways in our contest area! I love the Emoji charms! The poop emoji charm is so cool. oh, so many cute ones! I love the Gingerbread House, Wish Upon A Star, Mystical Unicorn, Family Infinity ! I love the Disney charms. I like the Bloom in Rose charm and many of the other rose gold charms. My favourite Persona World charms are the “Wish Upon A Star” and “Mystical Unicorn” charms. I could spend a long time on their site – so many choices! I love the Limited Edition Peanuts© by Persona Holiday Box Set and I would love to get the Diet Coke can for my sister! Haha, I was not expecting to see Coke charms, but I love them!! I also love the Forever Treasured, both the Sea Turtles, and the Sand Dollar. My favourites are the Rose collection and the Snoopy collection! The Joy To The World Christmas ball charm has caught me eye. 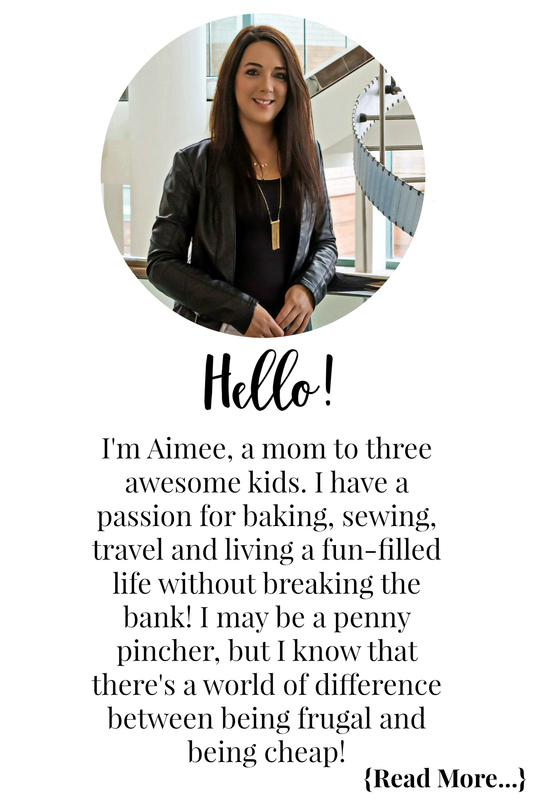 I like the “Teach, Inspire, Grow” Charm and the birthstone flowers – I’d get one for each family member. I love charms from The Beatles collection! I love all the animal charms. Especially the one that says I love my Dog. I love all the Coca-Cola charms. I love Persona Rose line and especially the Sparkling Rose Spiral charm. I am shopping for my daughter who is due to have our 1st grandbaby May/18 sooo I saw Her Feet with a pink stone or His Feet with a blue stone = perfect gift for when the baby is born. Oh my did you see Pawesome Friends with the cat & dog. Daughter is a Vet Tech thus this would also be wonderful for her. My fav is Waiting for Santa with snoopy sleeping at the foot of the christmas tree. I really like the style and look of the December Flower. Love the charms on the Peanuts Holiday Gift Set! I also love the Christmas Coca Cola ones as my brother gives me something like the polar bear stuffie from the Coke Collection every year. I love the mermaid and the British Crown charms. The Sea Life with the seas glass is beautiful as well! I love the Beatles – Strawberry Field forever. It brings back memories of the my Beatles tour in Liverpool and my trip to Strawberry Field in NY. I like the Hearts of Rose charm. I love the Lively Lizard and the Frosty & Family charms. I love the peanuts charms! They are adorable! I love the angel and candy cane charms. I love their Peanuts collection, especially the Buckingham Snoopy charm. I love the ” endless love” charm , as well as the June birth month charm for my birthday 💓 They have a lot of beautiful charms for a wide array of things close to ones heart . I love all the disney charms! We are big disney fans here (especially my parents) so they are so cool! I love the two candy canes making a heart charm and the gingerbread house charm. All of these terms are beautiful. I LOVE the gingerbread house charm, or any of the Beatles charms! I started one of these bracelets for my daughter on her first birthday. I add one charm a year, and plan to give it to her for her 18th birthday! Any of these would be welcome additions! I like way to many,, but candy cane love stood out as well as rose endless love and family infinity. I love the “All About Mom” charm, so pretty! I am loving the Coca-Cola ones. I like the Hearts of Rose charm. Very pretty. My favourite is the Snoopy collection! I love all the Christmas ones: the poinsettia, the Christmas tree, the Candy Cane love one and the Joy to the World Christmas ornament. I love the disney ones and the birthstones.